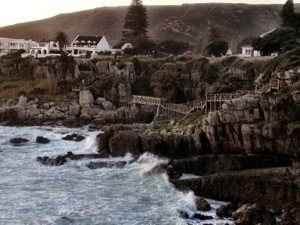 It took us forever to find our hostel in Hermanus. We drove around in circles in the suburbs of the city until we finally asked for directions. What? We weren’t IN town?! God, we are honestly the worst travelers ever. “Thank you!” We shouted as we drove down the road and hit the city center. We are always amazed at how large the beach towns are here. When we see the word “bay” and “town” with a tiny little dot on the map, we expect to pull up at a small town with a few hundred people and one little backpackers hostel. But in a country with 26 million people, all the towns have become cities, and they all have suburbs and centers and the such. You think we would have learned that by now. In the end we did find it, just on the other side of town. And the search was worth it! The place was half a block from the beach, and had all the amenities a backpacker could want. We were in a large dorm, but only had one other roommate: Jake, a young guy from England that was just beginning his trip through South Africa. We did intros ad caught up on stories, then Kelsi and I headed out to the “cliff walk”. We were both ignorant enough to think that the cliff walk would take place on the surrounding cliffs that stood high above the city. Instead, the cliff walk was a walk along the water, on a boardwalk that hung on the cliffs above the water. It doesn’t matter though, the walk was stunning. Albeit a little sketchy, the wooden boardwalk was an incredible way to see the water. The waves were huge, and crashed over massive rocks below. I couldn’t help but think of how epic this place would be in a storm. We arrived at the cliff walk exactly at sunset and sat on some overhanging rocks as we watched the light disappear. We spent a little while walking around town, then back to the hostel to grab Jake for dinner. We went to this tapas bar that was recommended to us and sat down to feast. Jake had his heart set on steak. “Hey, what’s a calamari steak?” He asked Kelsi. When dinner came out, Jake had quite the surprise. Apparently Jake had never had calamari and thought that calamari was just a different cut of beef. We all laughed, but he ate the whole thing and seemed to enjoy it. “If it’s squid, why wouldn’t they just call it that?” He asked afterwards. To be honest, we were stumped. I’m not exactly sure why squid is called calamari. It’s just something I always knew. After dinner we walked back to the hostel, played a couple games of pool and played fetch with the hostel’s crazy dog. Then off to bed. Kelsi apparently didn’t hear this, and just went to sleep. In the middle of the night she was woken to the sound of Jake wandering around the room. “Who are you?” He shouted, “who are you?Kelsi, Kelsi!” He called out to her. “Oh” said Jake “that’s embarrassing, I’m half asleep and half awake right now” then he went back to sleep. A little while later he woke up again. “Who are you?! Tell me who you are!” He got up, walked around the room a couple times and then crashed back into bed. How I slept through all this I have no idea, Kelsi on the other hand spent most of the night lying awake with a pounding heart, wondering what the hell was going on. By the time our alarm went off Jake and I had had a great sleep… Kelsi was in desperate need of a coffee. Another day of adventure ahead of us! 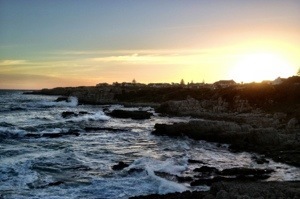 This entry was posted in Africa, South Africa and tagged calamari, cliff walk, Hermanus, ocean, sleep walking by hilarylust. Bookmark the permalink.